Benjamin McKean speaks to the crowd during the Great Decisions lecture series held Friday at the William Street United Methodist Church in Delaware. Populism is a political ideology that argues against elitism, according to an Ohio State University professor. 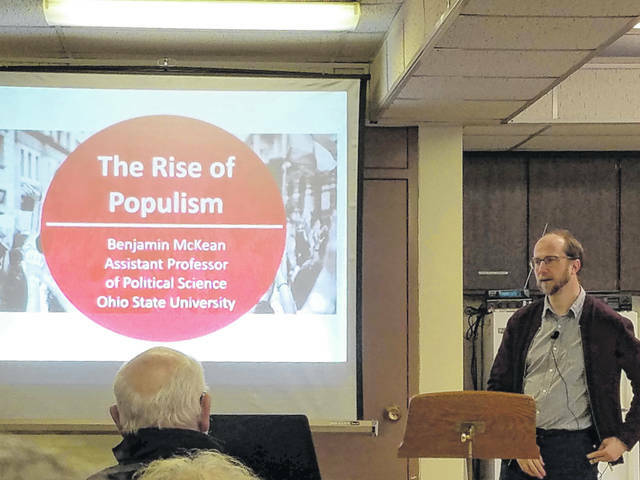 The conservative Tea Party movement in the United States is an example of populism, according to Benjamin McKean, who spoke Friday as part of the weekly Great Decisions series. He linked populism to economic anxiety. McKean defined populism as political ideology that supports the well-being of people. The definition of people varies from party to party, he said. He narrowed the definition by defining populism as a kind of anti-elitist politics. “I think it’s an important subject, and I think there are too many unhappy people in the United States,” audience member Rand Guebert said after McKean’s presentation. McKean linked populism to frustration about the economy. “And often, this frustration is expressed as a desire to turn away from the global economy, to renegotiate NAFTA, to leave the European Union, to impose tariffs on China, and also to restrict immigration insofar as immigration is an economic issue,” McKean said. He further elaborated the economic anxiety by discussing the cost of college. Over the past 30 years, he said, the real cost of college tuition in fees for four-year nonprofit private colleges grew by 129 percent and for public colleges 212 percent. He said student debt is the second largest source of household debt in the country. “In the U.S., there is more than $1.4 trillion in outstanding student loans,” McKean said. In 1990, the median debt for a student was around $12,000. In 2015, median debt was more than $30,000, while median wages were close to flat, McKean said. Azmeh Talha is a sophomore at Ohio Wesleyan University majoring in journalism.